A few media outlets have been receiving their invite to a special event for Research In Motion and AT&T on August 3rd in NYC. 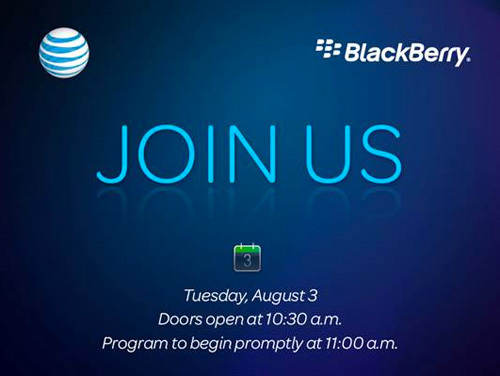 This event is a good sign and gives more belief to the rumor that we could see the 9800 Slider release on August 15th. It will be interesting to see what RIM shows at the event. Perhaps even the Bold 9780? We’re hoping RIM will showcase the 9800 and BlackBerry 6 to the fullest extent. This needs to be a key press event as BlackBerry continues to lose market share against Google Android and Apple iPhone. We did not receive an invite from RIM, which is typical and quite frankly distasteful. Don’t worry though, this will not hold us back in reporting on what is announced at the event. Not being invited to press events will never stop us from giving you the best insider look at BlackBerry.